I have finally gotten around to taking pictures of my newest beret! The pattern is Selbu Modern by Kate Gagnon Osborn (free pattern on Ravelry!). It has been a loooooooong time since I have done any strand color work. Lately, I have been seeing tons of color work patterns on blogs and in magazines. Inspired by others, I chose to head down a road that had been a little forgotten. With any skill, if you don’t practice it frequently it gets rusty. My brain was feeling a little foggy, so I hit the internet to refresh myself on strand color work. I found this great tutorial on By Gum, By Golly by Tasha. She has done a great job really fleshing out this technique. Tasha highlights two of the main things that cause wonky looking color strand work: carrying the yarn and tension between floats. For carrying the yarn, I used Option #2 for holding my yarn (one strand Continental style and one English version). After a little practice, I noticed the two hand method got me across rows a little faster. Yay! However, realized about half way through my work that I was not holding the main color and contrast colors in the correct hands. Therefore, only me and those of you with expert knitting eyes will note my color dominance variation. Not that big of an issue in the long run. I can live with it as the other option would have been to restart the entire pattern. Tasha also had some great tips on keeping the tension in balance. 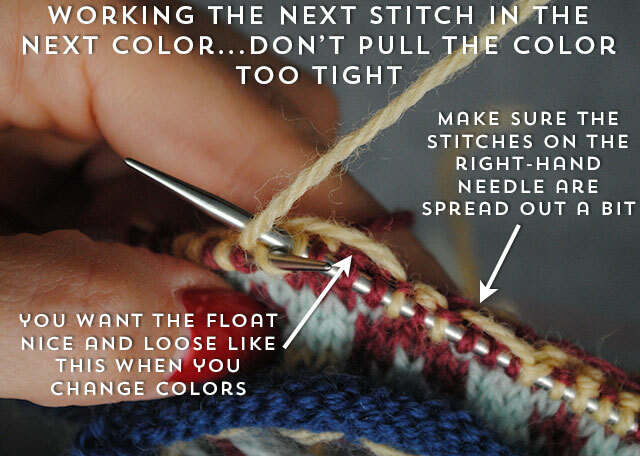 The tip that resonated with me was no to scrunch up your stitches (something I do all the time) on the working needle. This made a really big difference. My floats were the right amount of loose, which kept the piece from puckering. 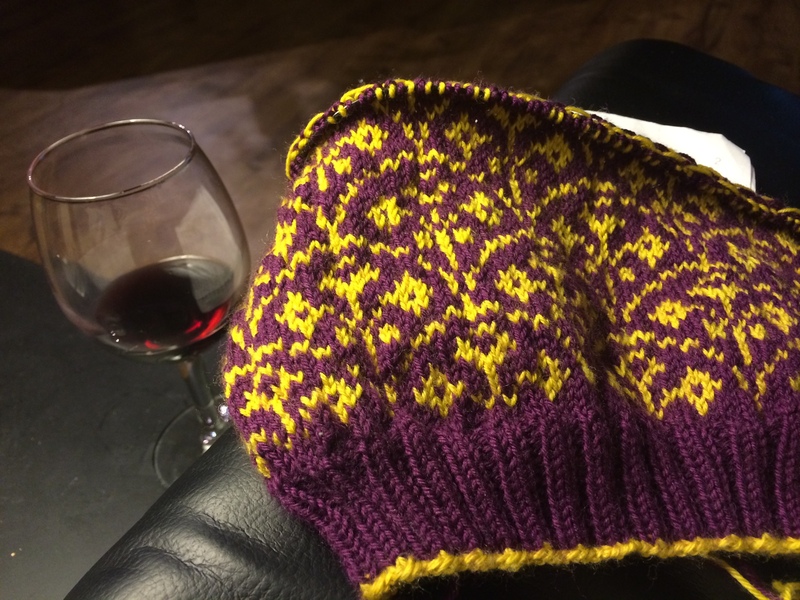 Well two weeks, several tips, and many glasses of wine later, I finished my Selbu! As you can see I had some tension issues with the contrast color toward the top of the hat. But overall not too shabby. It’s beautiful and nobody would look at the top of your bead with all of the other details anyhow. Great color choices. BEAUTIFUL! The colors are lovely. I haven’t ventured into stranded color work yet but I’m itching to try it out. My weekend project was (still is… not finished yet) a pair of socks for my husband in the colors of his favorite hockey team. I found a variegated sock yarn that has all the colors of his team so I thought I’d whip up a pair before hockey season is over. Thankfully we’re only halfway through the season! That is such a good idea for your husband! My BF doesn’t like hats, but socks are a good way to show team spirit. I am searching for a hat pattern for a chemo patient and this was one I was considering. I am taking your post as a sign it is the one I should do! I think it is😉. It is a great knit. The perfect amount of challange with great results. It takes some concentration, but the finished tam is worth it! Looking forward to seeing your completed project!